California death metal horde Acephalix – featuring members of Vastum, Necrot, Depressor, and more – has completed their third LP, and is preparing to unleash Decreation upon the public masses in September. New label home 20 Buck Spin has unloaded a YouTube stream of the album’s pummeling second track, “Suffer (Life In Fragments),” along with early pre orders for the record. Tomorrow, Bay Area death cult Necrot – founded by current and former members of Acephalix, Vastum, Saviours, Watch Them Die, Atrament, Rude, and more – will drop their anticipated second LP, Blood Offerings, via Tankcrimes. The eight-tracks comprising Necrot’s Blood Offerings were captured by Greg Wilkinson at Earhammer (Vastum, Graves At Sea), mastered by Brad Boatright at Audiosiege (Nails, Gatecreeper), the album completed with unholy cover art by Marald Van Haasteren (Bolt Thrower, Baroness). Blood Offerings will see release on CD, LP, and digitally via Tankcrimes, and on cassette through Sentient Ruin Laboratories. The limited vinyl edition comes as a foil-stamped, gatefold deluxe LP available in four color variants: 150 in purple splatter, 350 in gold splatter, 500 in black, and 1000 in gold. 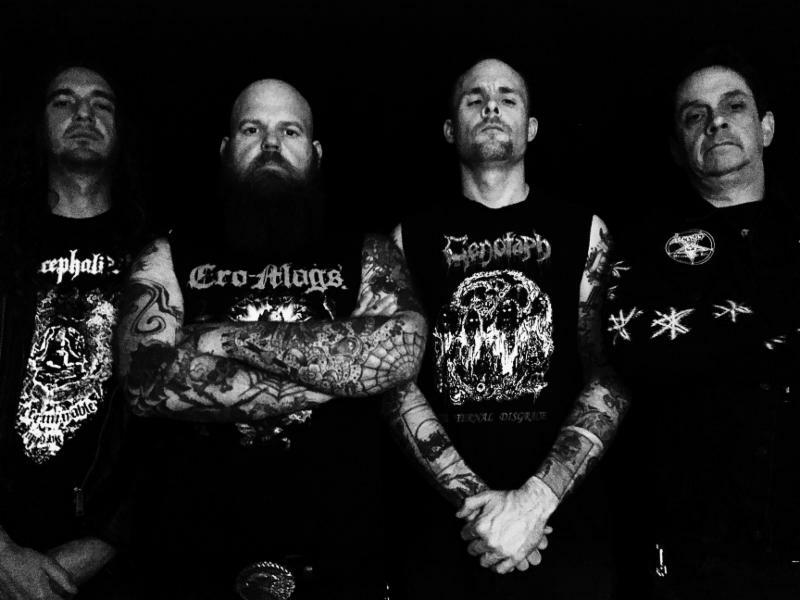 Two weeks following the release of Blood Offerings, Necrot will embark on the month-long Make America Death Again Tour with Denmark-based death metal tyrants, Undergang, running from June 30th through July 29th. The band will also make their way to Europe this fall for a journey that will include stops at Bloodshed and Graveland Fests. Further details to be unveiled in the coming weeks. This June, Oakland, California-based classic death dealers Necrot will unleash the fetid fruits of their Blood Offerings full-length. Set for release on June 9th, 2017 on CD, LP, and digitally via Tankcrimes and on cassette in partnership with Sentient Ruin Laboratories, the eight-tracks comprising Blood Offerings were captured by Greg Wilkinson at Earhammer (Vastum, Graves At Sea), mastered by Brad Boatright at Audiosiege (Nails, Gatecreeper), and will come sheathed in the unholy cover craftings of Marald Van Haasteren (Bolt Thrower, Baroness).